A stunning fruit tart filled with a rich almond cream and juicy plum filling. It’s only taken a year and six months but apparently The.Boy has only just (as in, last night) gotten really truly comfortable around me. How do I know?, you ask. Well because at around 11pm last night as I was exiting the bathroom after brushing my teeth, I stumbled upon him sitting on the couch. As if it wasn’t even a thing. In case you didn’t realize. IT’S A THING. A thing that I, personally, don’t do at all. But most certainly a thing that one should NEVER do in front of other people who one wants to someday sleep with them again. Just saying. The best part was that after I shrieked one of my signature piercing shrieks, he rolled his eyes and was all like, “Fine, I’ll use a nail clipper”. As if he were so put upon and was doing me a huge favor by doing so. I really make life hard for him, don’t I? And then I felt free to inform him that I was glad he wasn’t home on Tuesday night and thus didn’t get a piece of this tart, because he didn’t deserve it. It’s a Thomas Keller masterpiece after all. And is therefore much too classy for those who bite their toenails. 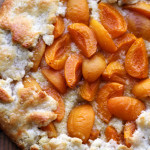 Then I went on to describe it in excruciating detail – juicy bites of sweet-tangy roasted plums enrobed in a luscious almond cream, all of which is encased in a sweet almond cookie-esque crust. So good that a few of my coworkers even went so far as to declare it as their favorite thing I’ve ever made. Now if that’s not incentive to drop his dirty habit, I’m not quite sure what is. Short of an anti-toenail biting patch. But hopefully we won’t have to go that far. For the crust, place all the flour in a medium bowl. Sift the almond flour and 46 grams of powdered sugar into the bowl, breaking up any lumps that had formed. Whisk to combine. Put the butter in the bowl of a stand mixer fitted with the paddle attachment. Beat it on low speed until it is the consistency of mayonnaise. Sift in the remaining powdered sugar and pulse to combine, then beat on medium-low for 1 minute or until combined and fluffy. Scrape down the bowl. Add the dry ingredients to the mixing bowl in two additions, mixing each time until just combined. Scrape to incorporate any dry ingredients. Mix the eggs in on low speed until just combined. Transfer the dough to a cutting board or work surface. Use the heel of your hand to smear it and work it together. Divide the dough in half and form each into a 4x6 rectangle. Wrap each in plastic wrap. Store one in the freezer to use for another tart or pastry and store one in the refrigerator until firm, at least 2 hours. Roll out the dough by putting it between two sheets of parchment paper and rolling it into a round that is about 11 inches in diameter. Fold the dough over the rim of an 8-inch Tart Ring that is sitting on a parchment lined baking sheet.. Don't worry if it cracks or comes a part a bit, just piece it back together with any overhanging dough. Remove the excess dough and freeze for 30 minutes or refrigerate for an hour. Meanwhile, prepare the almond cream. Sift the almond flour into a medium bowl, breaking up any lumps. Whisk together with the all purpose flour. Put the butter in the bowl of a stand mixer fitted with a paddle attachment and mix on medium-low, until it is the consistency of mayonnaise. Sift in the powdered sugar and mix on low until incorporated, then increase the speed to medium-low and mix until fluffy, 2-3 minutes. Scrape down the bowl. Add the almond-flour mix to the stand mixer in two additions, pulsing until just incorporated. Scrape the bottom of the bowl. Add the eggs and mix on low speed until combined and smooth. Transfer to a bowl and cover with plastic wrap. Refrigerate until cold, about 2 hours. Spoon the almond cream in the center of the now chilled tart dough and spread so that it fills the tart crust. Cut the plums into ⅛-inch thick wedges. Arrange a ring of plum slices around the outer edge of the crust so that they are facing the same direction and overlap by about two-thirds. 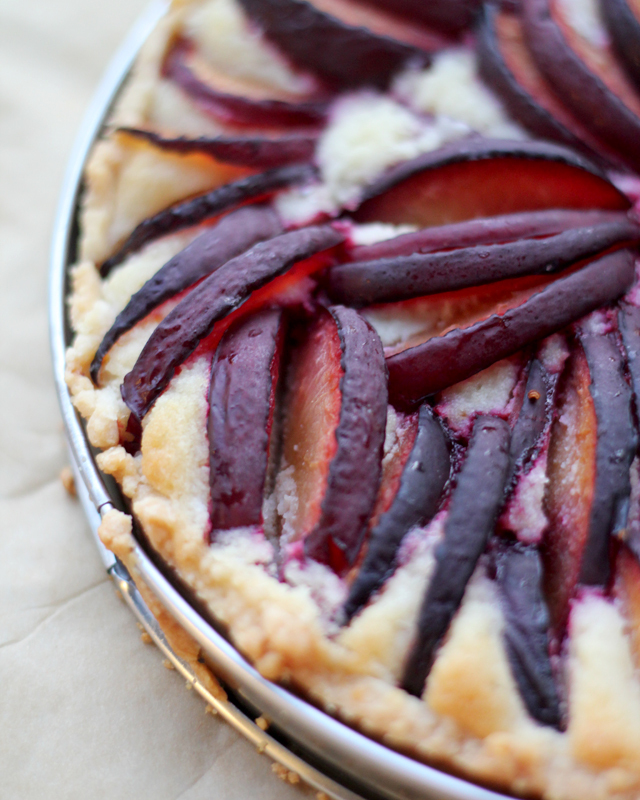 Continue with inner, concentric layers, until the center of the tart is filled with plum slices. Bake for 45-60 minutes, or until the crust is well browned, the filling is set, and the plums are soft and juicy. Allow to cool completely before serving. IF I bit my toenails (which I don’t), I would totally stop in order to get a slice of this tart! It is totally stunning, as you said. A lovely end-of-summer dessert! A gorgeous tart, Joanne. Love the almond cream! And really, I must draw the line at biting your own toenails. Guys can be so gross. He didn’t deserve a slice of that yummy tart! I am not sure how you can write a post about toe nail biting and in that same post make this tart irresistable – true talent my friend! No he didn’t! I’ll admit to having bitten my toenails when I was under-6 but not after! no no no! Yikes! Biting his toenails?!?! Well, guess the boy must be super flexible! I’m so sorry you had to witness the toenail event. It just goes to show that you can never underestimate the male species. I am absolutely crazy for almond cream!! This is a definitely a stunning tart. Worth every single calorie. Hahaha. Good for you! Show him who’s boss. This tart looks absolutely wonderful. This post made my day. My first thought was, wow how super flexi he must be to be able to bite his toenails. Lol! Congrats on amping up your relationship to the next level. Haha! This tart though… amazing! Beautiful. Delicious. Perfect! 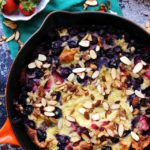 This is such a great combination of plums and almonds, and I love the color of this tart, autumnal and cheery!! Thanks for another great post, Joanne, and best wishes for the weekend! Hilarious indeed… Since Phil doesn’t read food blogs, I can share a little dirty secret. He does not bite his toenails, but he cuts them with his fingernails. I know it is hard to comprehend how it can be possible, but he lays on the sofa, foot in the air, and slowly attacks each toenail with his fingers. How he does it I don’t know, but we had this exchange of “Fine, I will use a clipper instead” – as if I am forcing him to drink warm salt water or something worse. Our species took hundreds of thousands of years to develop the nail clipper, but apparently we fell in love with Neanderthals. Ha! He should KNOW not to do something like that in front of a prolific blogger. If I promise I don’t bite my toenails, would you share this tart with me? I would stop any bad habit for this tart. It’s a great combination of plums and almonds. Love it!! Ps: how the hell is he getting his toes in his mouth? Insane baby flexibility and precision. Oh my goodness-I just got home from the dentist and that story about the toenails is a great incentive not to eat for another hour! haha!! I love your the bf stories! But on to more important things this tart is ah-mazing! Absolutely gorgeous. Hahahaha! OMG, I almost died laughing at this post. It takes special skill to reach your toenails, I will say that. Potential circus acrobat here? In any case, I’m glad you had this incredible plum tart all to yourself and were able to enjoy it without the distraction of in the next room. 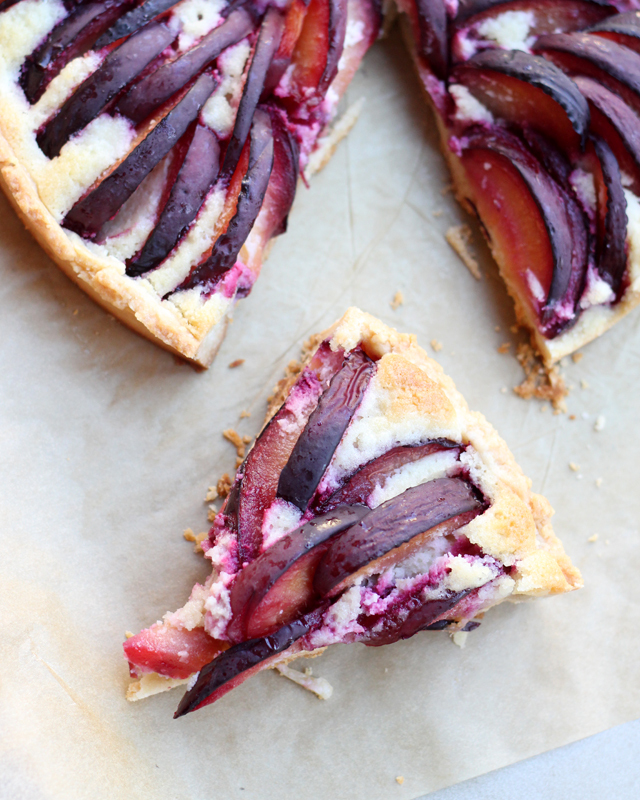 I love the way that you style your plums on these tarts. I don’t know if I am more impressed or what with your boyfriend. You have to be pretty flexible to bite your toenails! I also am IN LOVE with this recipe. Perfect for entertaining or bringing it to a party. Bookmarked! I met Thomas Keller a few weeks ago and I was pretty much starstruck. I’m split between shrieking and cracking up…but mostly cracking up, this is hilarious, Joanne! This tart is positively lovely! I LOVE all things almond flavored!! I am totally impressed by his flexibility! Well done boy! But yeah – gross! No one’s toenails are clean enough for that! He definitely didn’t deserve a piece of this beautiful tart. I think I just threw up a little. OMG – that is so gross!!! The.Boy. needs to NEVER do that ever again – you can tell him I said so too. 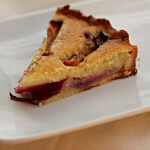 The plum tart looks lovely and delicious! This tart is a absolute winner and it’s so beautiful with that color! I don’t know if I want to eat it, or frame it.. well ok I’m going to eat it! I’m torn between how terrified and grossed out I am, and how much I want to eat this tart. So many emotions are swimming inside of me… but I think the tart wins out! You are a talented writer, Joanne. 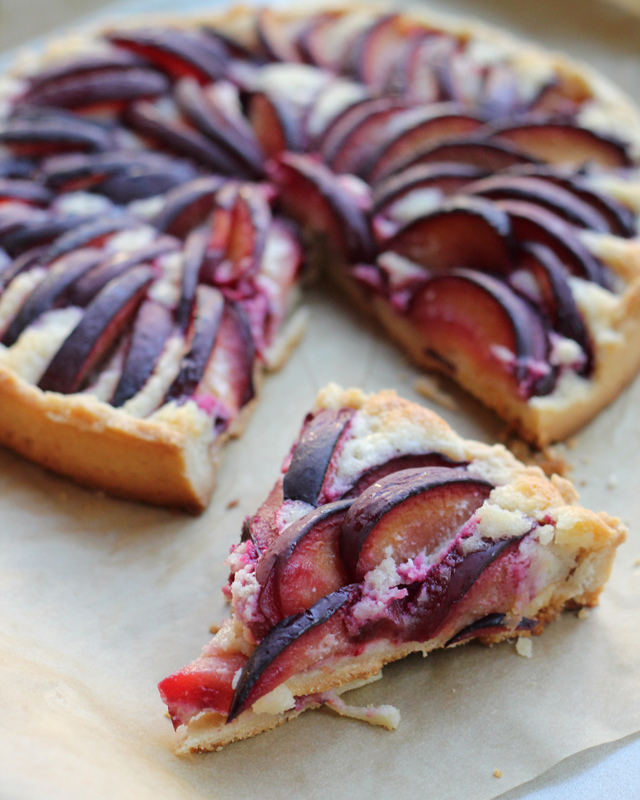 The plum tart looks outrageously delicious! Totally love the colour. An absolutely stunning tart! Loving all the almondiness (that is a word, isn’t it?). As far as The.boy, how the heck does he get to his little toes? He must look like a pretzel by then. Men. The link to the Beer, Bean & Cotija-Stuffed Poblanos actually goes to a (lovely) pic of the plum/almond tart. Great pic though! consider yourself lucky – anyone flexible enough to bite their own toenails is in super physical condition and will live a longer, healthier life than those who cannot (or won’t). just sayin’. I’m torn between being grossed out and impressed by the fact that he’s flexible enough to get his foot to his mouth! Yikes! I only think it’s cute when babies put their toes in their mouths. 🙂 This tart looks to die for. I flip through that book on a weekly basis, looking at all the things I’m going to someday make. I’m cooking from Ad Hoc this weekend. and – wowie! what a beautiful tart. I think I might make this tonight. Love the purple color! well the boy is so darn flexible but the whole idea of biting toenails – NOOOOOO. These tarts with almond cream sounds so delicious. I really need to get into making my own crust. Oh my yes, it is a thing!!! And so is this tart – only it’s a good thing! I love this trat look stunning! have a nice weekend! Well that would have sent me in the other direction screaming, FAST (I have a weird aversion to feet as it is). But hey, at least he was taking care of his nails? I dunno. What I do know is I need a slice or five of this gorgeous tart as soon as possible. That tart is seriously a thing of beauty. Gorgeous! Joanne if my husband bit his toenails they would probably break his teeth!!! I don’t know if toenail biting is worse than having these big clippers come out and hearing them bang into walls and furniture. It’s an event….lol. The pie looks over the top delicious. Just perfect with some coffee or anytime really! Yikes – I don’t think I’d want to kiss him after that. The tart looks kissable though! I found you through Rambling Tart… and speaking of tarts, WOWZA! Beautiful!! Nice to “meet” you, such a lovely site! Gross on the toenails!! That is one of the most beautiful tarts I’ve ever seen Joanne. The photos are stunning! Toenail biting is NOT a thing!! Gah. Seeing someone do that is my worst nightmare…I hate feet! At least he showed you this early on! 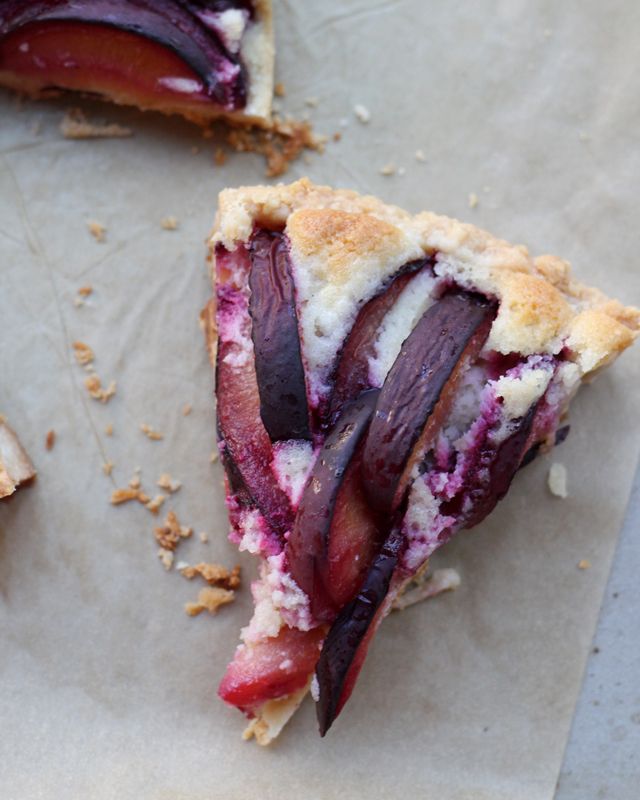 lol But on to nicer things…liiiiiike this tart. It’s stunning friend! I love the almond cream! Gorgeous Joanne. I love the almond cream. The ultimate filling for just about any tart. I just want to dive in. Haha! I laughed out loud Joanne. How hilarious. Don’t you just love when you can reach that level of comfort with someone? It is a very good thing! What is also good? This tart. Just heavenly. I am always in need of more almond cream in my life! Hilarious! Biting your toe nails is certainly not something anyone should see. He certainly is VERY comfortable with you. 😀 And this gorgeous tart is certainly a masterpiece. Well done Joanne! That is pretty impressive, I have got to say. I don’t think I’m flexible enough to put mouth to toe. I saw this tart on your instagram feed last week (Or whenever it was) and have been drooling ever since, waiting for the recipe. I can totally understand your coworker’s reaction. It looks irresistible! My husband uses a nail clipper, but somehow I can HEAR him doing it from the other end of the house even when he’s in the bathroom with the door shut! I don’t know how, other than that he has seriously thick toe nails and perhaps the process requires a fair amount of noise. I find it very off putting! On the other hand, I find this tart very welcoming…very welcoming indeed. Um, ew, more tart for you? Omg, you are freaking hilarious! In excruciating detail, huh? The words alone would whip me into shape, pronto! 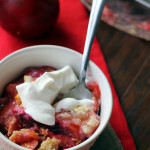 Love the sound of the plums, cream, AND cookie crust …win all the way! Joanne you are so funny! I love this tart and I have so many recipes of yours on my list of things to do- its crazy good! I only wish the days were 36 hours instead of 24 hours, so I can get some things done around here! Love this recipe! YUM! This tart looks phenomenal!! As for the toenail biting… I can’t. Yuck. Haha! the nail biting is hilarious! oh man, this tart looks phenomenal! I want a huge slice of this with some strong coffee for breakfast! You make seriously the prettiest, yummiest food! You have some serious skills, Joanne! Your guy must be dying that you shared this story. I would be reevaluating my relationship 😉 My mom won’t even clip her toenails in front of my dad and they’ve been together a very long time. Ooo…I think this is what some of the 2 lbs of plums I got from my CSA this week want to become! This is an outstanding story…love the entire thing, including the plum tart. Yep, that’s comfortable… Really, really comfortable. I guess you could take it as a really gross compliment? Nothing that can’t be changed with a delicious tart bribe/temptation. Good thinking! Looks like a wonderful sweet treat! Just discovered your blog and find this recipe absolutely delightful. YUM! I am so CRAZY for stone fruits. Cannot wait! You are quite right, he didn’t deserve a slice of this tart! This tart is a total stunner! Bhahaha! And the tart looks wonderful! Ok, that is definitely a “thing”! It is funny how the longer you are with someone how they start to loosen up and do things you had no idea they would do! I’m sure this tart will encourage him to break that icky habit! What a gorgeous tart! I’ve been obsessed with plums this season. That almond cream… just, wow. This is the perfect dessert to get your boyfriend to stop biting his toenails. I mean plum’s surrounded by almond cream?? COME ON! He must be very flexible to be biting his toe nails. 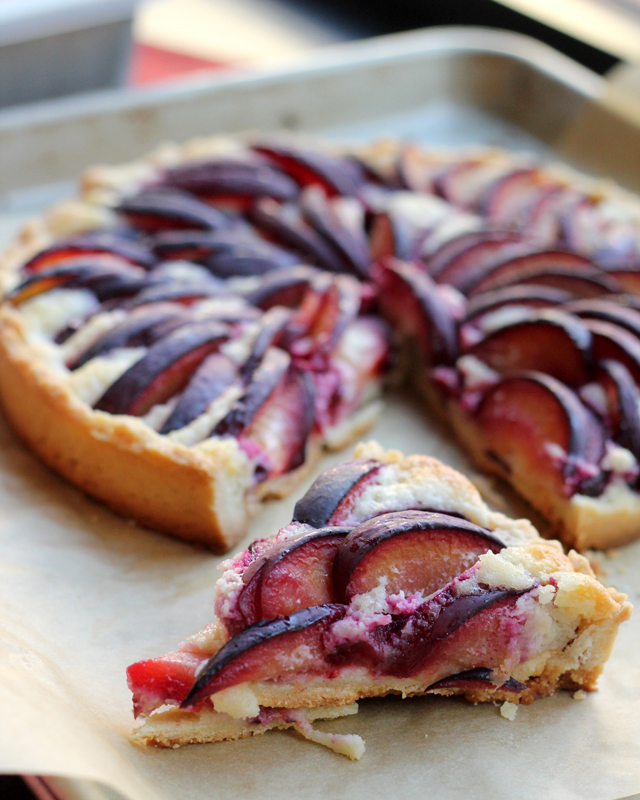 This plum tart looks amazing. I have never baked with plums before and have always wanted to, this post is inspiring me to do so. *shudder* I’m going to pretend I didn’t read anything in this blog besides the recipe and delete that from my memory. The tart! It’s so pretty. How pretty is this?! It sounds wonderful. What a great recipe! I’ve already made peach and almond cream tart and it was phenomenal, everyone who tried it said it was magnificent. Thank you very much for sharing this wonderful recipe with us here! Just wondering… how many of your readers ended up TRYING to bite their toenails? But maybe The Boy should get an AWARD for some kind of flexibility. Or maybe, a slice of this amazing tart. Here I am square on fifty, and I would be delighted to be able to get my legs in a position to bite my toenails. Tell him he is just showing off and show-offs don’t get plum tart. Meanwhile, I’d love some, please. Beautiful tart, I love the colour of it and the flavours sound delicious. I feel for you Joanne, it must not have been a pretty site. Oh, Boy. IT’S DEFINITELY A THING! Thank goodness you had this tart to take your mind off things. This is the stuff dreams are made of. I’m giving dairy a try this weekend and if all goes well, I’m making this. Like, immediately. It’s pathetic, how far behind I get in reading food blogs. I’m just now catching up on your posts and when I read “almond” I knew this was the first post to read. O.M.G. I started laughing, hysterically. Does The.Boy read your blog? He must. No secrets, here. How anyone can even bite their toenails is beyond me. Then again, I’m the one with a healing, new bionic knee. Moving along… this looks incredible, and right up my alley. Gotta pin this one. It’s a beauty. Hello Joanne! The tart looks and sounds delicious and I would like to make it but how many eggs are 3.5 tbsp of eggs? It’s the first time I see it in a recipe…. One large egg should be about 3.5 tbsp. You can always beat the egg and then measure out the volume! This sounds so good! Love this idea! It takes a bit of skill, special equipment (tart pan, food scale, mixer with a paddle, large cookie sheet, room in the freezer or fridge, patience!) and a good part of the day. (In case anyone else wonders… didn’t have the paddle, but made due. And my tart pan looked different (fluted with a rim) but worked perfectly.) Thank you again! The recipe seemed complicated so I wasn’t sure if I wanted to try it, but was surprised when I started working on it. It really isn’t that complicated and has a lot of flexibility for timing everything. It’s just important to start early because of the need to chill between tasks. I don’t have a tart pan so I used a springform cake pan. It worked perfectly. I weighed my eggs before using to make sure I was in the ballpark of what the recipe indicated, but didn’t worry about making the amount exact. The tart turned our great. I don’t think it compromised my end product. I will use this recipe again. Everyone enjoyed it and it has a lot of visual appeal. Thank you.